(“The Pain and the Itch”, produced by CustomMade Theatre, plays at The Gough Playhouse from January 14 through February 09, 2014. )The collapse from within of middle class and upper middle class American families is a recognizable genre in American theatre. Edward Albee has given us everybody’s favorite marital disaster, George and Martha (“Who’s Afraid of Virginia Wolfe”) as well as the country club alcoholics of “A Delicate Balance”. Arthur Miller offered the confused and ethically challenged Willie Loman of “Death of a Salesman” as well as the questionable industrialists of “All My Sons”. More recently, we have seen Yezmina Reza’s riotously funny, “God of Carnage”. Bruce Norris’s “The Pain and the Itch”, which is given its bay area debut with this production, is most like the last, but definitely stands on its own in its presentation of a family Thanksgiving gone insanely askew. 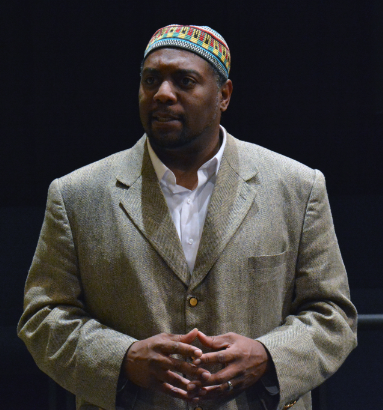 Dorian Lockett is impressive as the mysterious Mr. Hadid in CustomMade Theatre’s production of “The Pain And The Itch”. Photo Credit: Jay Yamada. Kelly and Clay are the proud parents of preteen Kayla and a new infant. On Thanksgiving they are hosting the mysterious Mr. Hadid, Clay’s widowed mother Carol, his plastic surgeon brother Cash, and Cash’s girlfriend-of-the-month Kalina. They are hard people: notice the alliteration of all those “K” sounds. They live in a world of conflict and cacophany, which can be contrasted to the mysteriously calm, still and contemplative Mr. Hadid (superbly and subtly enacted by Dorian Lockett, making his CustomMade debut). Mom Kelly is the epitome of uptight, and her house husband Clay, as played by Justin Gillman with a very funny cringe-inducing stutter, is clearly unravelling under her too-watchful judgmental eye. There are many and complex problems facing this family — not the least of which is in the hands of the secretive Hadid — which are gradually revealed, to hilarious comic effect, as the play unfolds. The presenting problem, however, is a mysterious groin rash experienced by daughter Kayla which Clay has kept secret from his wife and mother, but has revealed to estranged brother Cash (the plastic surgeon) whom he asks to examine her. Over the course of two acts a variety of mysteries are explored: who is the mysterious Hadid and why has he been invited to dinner? What is the nature of the mysterious rash? About what is Grandma Carol in such vehement denial? What is the history of the estranged brothers? Who or what has been chewing on the avocados? What is hidden in the past of Cash’s foreign girlfriend? As more and more complexities unfold, the family’s tenuous claim to be simple folk with straightforward family values becomes increasingly absurd, as noted by the ever more appalled and amused Mr. Hadid. This is a complex, entertaining, thoughtful and wildly funny play, well-written, well-staged, well-acted and well worth attending. “The Pain and the Itch” by Bruce Norris, produced by CustomMade Theatre. Director: Dale Albright. Scenic Design: Stewart Lyle. Lighting Design: Hamilton Guillén. Mr. Hadid: Dorian Lockett. Kelly: Karen Offereins. Clay: Justin Gillman. Kayla: Gabriella Jarvie. Kalina: Eden Neuendorf. Cash: Peter Townley. Carol: Jean Forsman.